HCC-500-1 heating cooling chamber has been designed for burn-in testings. The unit can be operated and programmed from the touch screen terminal, located on the front side of electric cabinet. The plate can reach temperatures in range of -90 to +150 oC. 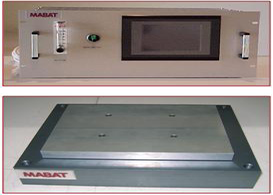 Target temperature of the plate or module is defined in the pre-programmed recipes and controlled by electrical heating element and liquid nitrogen according to recipe. Liquid N2 Pressure 100 psi Max. Gas N2 Flow 50 lpm Max.